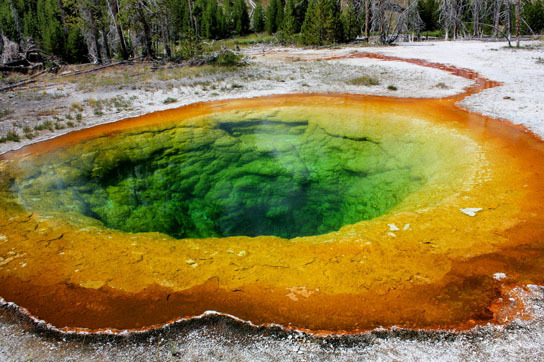 Green sulfur bacteria, whose exceptional light-harvesting capabilities inspired the artificial system analyzed by postdoc Dörthe Eisele and her co-workers, dominate this hot spring at Yosemite National Park and give it its striking green color. Hoping to find a more efficient light-harvesting process, MIT scientists analyzed an artificial system that uses a self-assembling system of dye molecules that form perfectly uniform double-walled nanotubes similar in size, shape and function to natural receptors used by green sulfur bacteria. Companies that make commercial solar cells are happy if they can achieve 20 percent efficiency when converting sunlight to electricity; an improvement of even 1 percent is seen as major progress. But nature, which has had billions of years to fine-tune photosynthesis, can do much better: Microorganisms called green sulfur bacteria, which live deep in the ocean where there’s hardly any light available, manage to harvest 98 percent of the energy in the light that reaches them. Now, researchers led by an MIT postdoc have analyzed an artificial system that models the light-capturing method used by deep-sea bacteria. Further advances in understanding fundamental light-harvesting processes may yield entirely new approaches to capturing solar energy, the researchers say. Their results were reported July 1 in the journal Nature Chemistry. The artificial system, described in an earlier paper by postdoc Dörthe M. Eisele of MIT’s Research Laboratory of Electronics and collaborators, consists of a self-assembling system of dye molecules that form perfectly uniform double-walled nanotubes. These tubes — only about 10 nanometers wide but thousands of times longer — are similar in size, shape and function to natural receptors used by green sulfur bacteria that collect energy from the tiny amounts of sunlight that penetrate to the ocean’s depths. “It is one of nature’s great secrets, how to harvest light so efficiently,” Eisele says. Her co-authors include Moungi G. Bawendi and the late Robert J. Silbey, both MIT professors of chemistry, along with collaborators at Humboldt University of Berlin, the University of Texas at Austin and the University of Groningen in the Netherlands. Eisele says this particular type of nanotube is unlikely to find practical applications. Rather, she says, these experiments were designed to study underlying principles that could then be used to find optimal materials for particular uses. “This system is so interesting because it is a beautiful model system,” she says, for analyzing how such structures respond to light. Unlike typical self-assembling systems in which each structure can be a bit different, these double-walled tubes, made from a cyanine-based dye, form perfectly uniform shapes and sizes. That makes it a perfect model system, Eisele explains, because knowing that all the nanotubes in a solution are identical makes it possible to study their properties in bulk, rather than having to isolate the response of each individual tube. One fundamental question the team wanted to address was whether the two concentric cylinders of the double-walled tubes were working together as an integrated system for capturing light’s energy, or whether each cylinder was acting on its own. Characterizing this simplified artificial structure may allow researchers to build more efficient light-harvesting devices. “Nature had millions of years to optimize” how organisms capture energy, Eisele says; understanding how it did so may lead to better man-made systems. The research was supported by the Deutsche Forschungsgemeinschaft, the Integrative Research Institute for the Sciences in Berlin, the National Science Foundation, the Alexander von Humboldt Foundation, the Department of Energy Center for Excitonics, the Army Research Office and the Defense Advanced Research Projects Agency. Be the first to comment on "Artificial System Models Light-Capturing Method Used by Deep-Sea Bacteria"